African dancers and musicians for hire. A group of multi talented performers from different countries and different cultural backgrounds, providing a diverse repertoire of dance and music from across Africa. 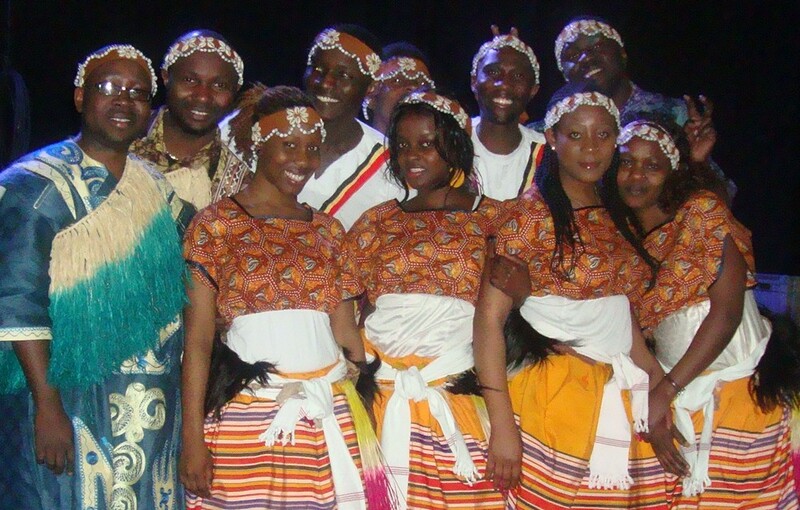 A group of multi talented performers from different countries and different cultural backgrounds, providing a diverse repertoire of dance and music from across Africa. Ngoma is led by Ugandan dancer and musician Seby Ntege, who performs with other African drummers, singers, dancers and acrobats from Ghana, Nigeria, Zimbabwe, Kenya, Uganda and Rwanda. During 2010 Ngoma were hired for over 20 World Cup-related events all over the UK and further afield. Seby’s musical appearances include teaching and playing at different festivals and drum conventions around the country, such as Drum Camp and the Edinburgh and Bradford Mela festivals. He put together a 21 man band, Embaire International, to play a giant 21 key xylophone for Her Majesty the Queen at Westminster Abbey in 2007 and in the same year took part in ‘Motherland’, a dance production by Sampad that toured the UK in commemoration of the 200th aniversary of the abolishment of the slave trade. In 2009 he led a week long music workshop summer school at SOAS and at the WOMAD festival played on Lucy Duran’s BBC Radio 3 show which came live from the event. Since its inception, Ngoma has held a number of school and community workshops, both in London and around the country. These are tailored to suit specific individual needs within groups of differing abilities, and to emphasize involvement for all participants. Performances range from the relaxing soft and melodic sounds of the thumb piano (endongo), panpipes (enkwanzi), tube fiddles (endingidi) and xylophones (amadinda) to the highly exciting, powerful and yet beautiful revolving rhythms of the ngoma. Or they can just play African drums! Perfect entertainment for any occasion, the group undertake many private and corporate functions with their high quality dancers and drummers. They also sing and chant, and can perform the South African gumboot dance.